Grain Elevators are ubiquitous buildings, yet there is little popular understanding of them and their origins. The basic arrangement of a grain elevator fits into two different "Type Families" based on whether it is a discrete building ("Self-Contained"), or a semi-dispersed cluster of structures (Annex). Within those classifications, there are several distinctive types based on grain bin design and arrangment. Construction material and assembly then determine different subtypes or material variants. An index to this and related typologies spells out the interrelationships concisely (without the clutter of images and descriptive text). Related and similar building and structure types are in a sibling websection. These types are buidings with enclosed shapes - not semi-dispersed structure complexes (i.e., the "Annex" grain elevator Master Type, below). They were the first developed, in the 1840s, and their designs survived through World War II, after which construction the Annex design probably became far more numerous. These are buildings with a generally rectangular footprint, and square or rectangular bins inside. The bins are either vertical or horizontal. These are buildings with a generally rectangular footprint, and square or rectangular vertical bins inside. They were the first true grain elevators to appear, made possible by the application of an elevating mechanism in 1842 (...Cromley on Banham, JSAH 1987), which is almost always indicated by a projecting headhouse on the top of the grain elevator building. They were mature and becoming common by the time of the Civil War. An excellent contrast between the mature "(Vertical Square-Bin) Grain Elevator" and the "Grain Warehouse with Grain Elevator" is in a this sample from the 1863 bird's-eye-view of Buffalo. Left: A construction photo shows workers atop the cribbing before being sided over (AIA Journal 11/77). Right: An unfortunate demolition exposes the plank cribbing that composed the bins in a grain elevator. The bins are built up with planks laid atop each other in log-cabin style, with ends alternately overlaping and spiked with large nails. A construction photo shows the posts, beams, and studs before they are sided over (AIA Journal 11/77). The bins are built of lumber studs and bracing with board walling). The bins are built of balloon frame walls, which are then braced on the exterior with bands of horizontal or strips of vertical wood planks. The bins are interlaced with a maze of tie rods extending through the bands to provide support. Tall elevators tend to have vertical bands, while shorter and horizontal bin types) tend to have horizontal bands. These are the ubiquitous small-town grain elevators. Many that survive are sheathed with iron or steel sheeting to protect the flammable wood from the sparks of steam locomotives (Talbot 1983). The small wooden elevators are often referred to as "country grain elevators" since they usually occur in rural areas or small towns. Forms: "Milk Carton" vs. "Soda & Straw"
Two forms of the Wooden "Country" Grain Elevator appear to exist: one that has a gabled cupola or headhouse atop the main body ("Milk Carton" form), and one that has a dependant turret adjacent to the main body and not atop it ("Soda & Straw") form. More observation and investigation is necessary to refine this observation. The wooden secondary buildings in the images appear to a separate, dependant, square-bin unit added to their group to increase capacity to the facility. The lack of a protruding headhouse clerestory/cupola indicates that it is dependant on the other (presumably main) building for its sorting and directing movements. These happen to all be wooden; presumably, there are also steel-panel and steel-frame versions. Though the term appears to be a part of the vernacular, I hesitate to call this subtype an "annex" since that would be confusing with the "Annex Type Family Grain Elevator." These are super-sized elevators found at terminal cities, where grain had to be transferred or stored, such as cities on the Great Lakes. By about 1900, wooden construction was rapidly falling out of favor in lieu of concrete and other materials. 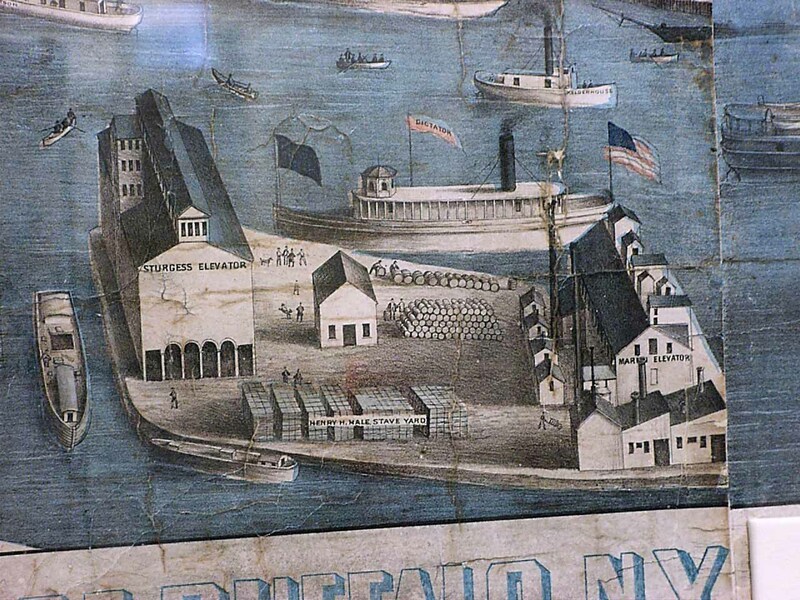 The top panorama is a view of the elevator waterfront of Buffalo, New York, sometime in the 1870s. The original image is in the History of Buffalo's Grain Elevators website. 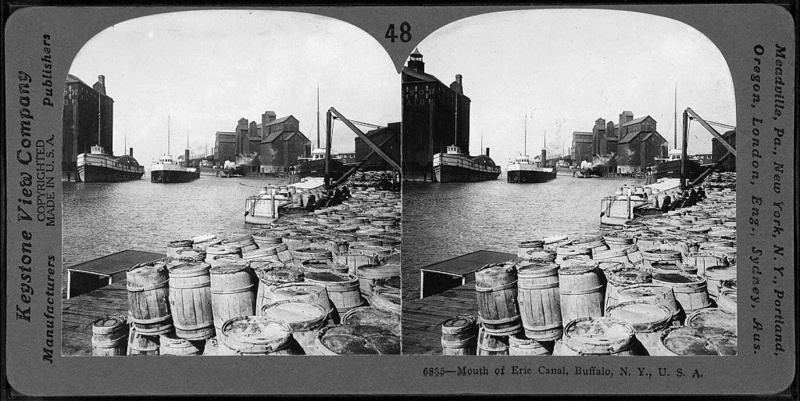 The "Brown Elevator" and other Buffalo panoramas are probably from the 1880s-1890s, and from the New York Public Library's Robert N. Dennis Collection of Stereoscopic Views. The last pan is looking northwest from (what was in the 1902 bird's-eye-view of Buffalo) the Anchor Line dockyard, with the Watson Elevater at the left edge, and probably the Bennett and Union elevators in the background. 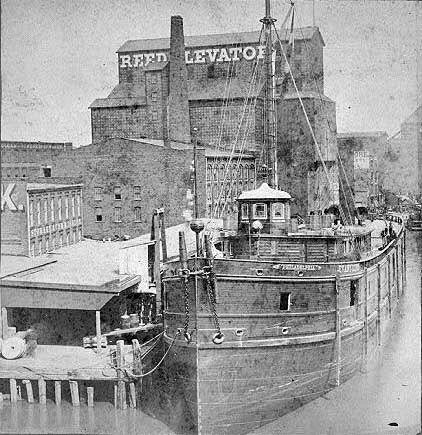 "Reeds Elevator" was said to be "the most complete elevator in all its appointments in Buffalo," New York, when it opened in 1862. The exterior and the roof wore a fireproof shield of slate. The original image is in the History of Buffalo's Grain Elevators website. The "C.W.Evans Elevator" replaced the earlier 'Grain Warehouse with Grain Elevator' original Evans Elevator in Buffalo which burned in 1862. (The original image is in the History of Buffalo's Grain Elevators website.) The other Evans image is from the 1902 bird's-eye-view of Buffalo, where the elevator appears to have been added along the cupola and on the side (or replaced; and the neighboring elevator is now also owned by Evans). The arcaded Elevator is the "Sturges Elevator" in Buffalo, New York. The image is from an 1863 bird's-eye-view of Buffalo. The two tinted drawings appear to be large wooden elevators (the patterns of squares are probably the ends of tie rods) along the Chicago River, in two details of a naively rendered 1857 bird's-eye-view map of Chicago, Illinois, available as a zoomable image online from the Library of Congress. Grain Elevators 4 - Post-Modern Grain Elevators!